Client Recommendations | Karin Andrews Real Estate . . .Experience, Diligence, Results. It is with pleasure I share with you my thoughts and experiences with Karin Andrews, an extraordinary person with many talents. I first hired Karin as an artist for a project in our home in 2000. Thru the years we have collaborated on everything from floral arrangements, to magazine articles, Garden Club events, digital pictorials, and kids playing by the pool. AND of course she has been our realtor as she began in that profession and beyond. Her knowledge of our property was amazing including its history. Her capability to put the property in pictures with music and beautifully written descriptions is incredible! I have seen many variations of others similar works but none that captures the soul like hers. We, and our families, have become long-lasting friends. We selected Karin Andrews to be our realtor for a historical family home after a significantly long search for the “right person”. She brought to the endeavor spectacular photography, hard to beat print materials, efficiency, and thoughtful vetting of potential showings. Her network skills are immense and her utilization of marketing skills are prolific. She is passionate about her work, she is highly professional, and quickly sizes up issues of significance. We cannot say enough good things about Karin. She has become a good friend of our family. Definitely 5 stars!!! Karin is the best realtor that I have ever utilized. 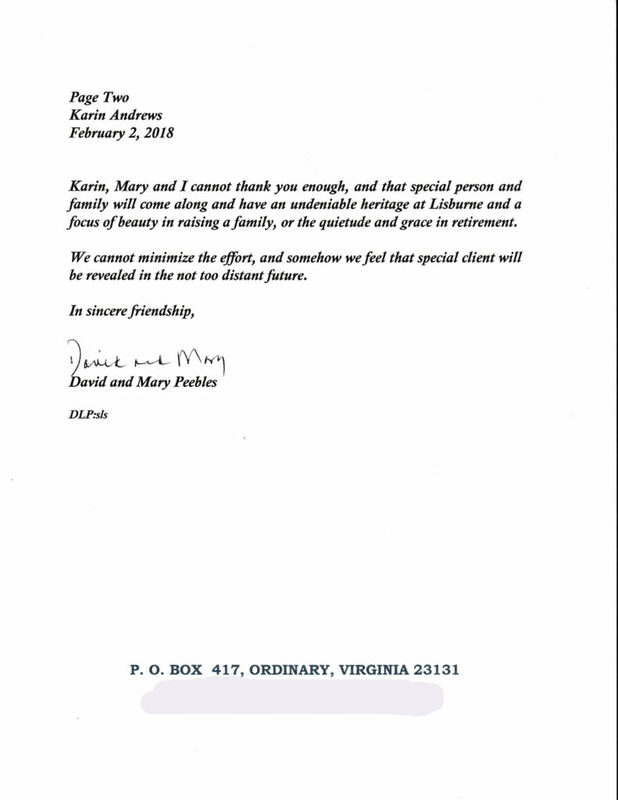 Her professionalism and knowledge of her niche market helped us navigate through the difficult sale of a unique property. I feel that she represented us in an aggressive and thorough manner. I would wholeheartedly recommend her to anyone seeking a a skillful and hardworking professional in real estate. We want to thank you so much for being part of making our dream come true of owning waterfront property in beautiful Mathews County, Virginia! 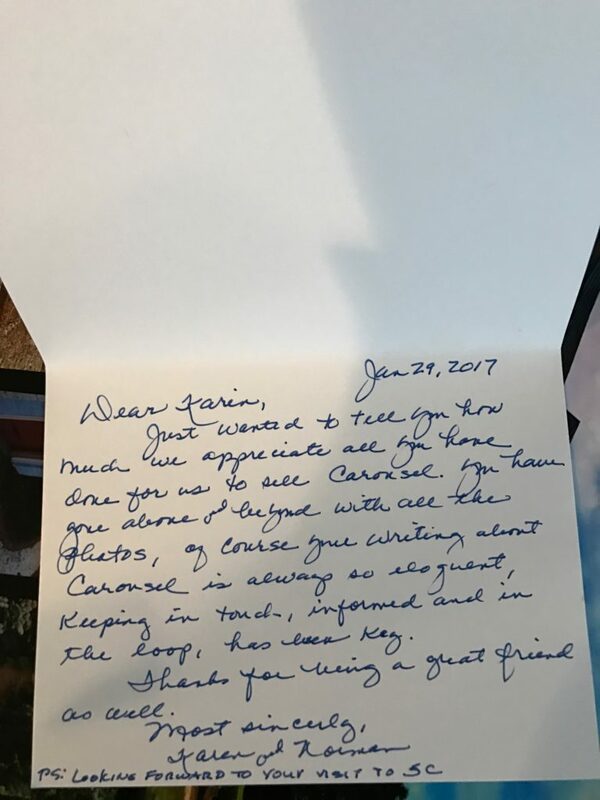 Your responsiveness and attentiveness to our needs during our property search was second to none – we really appreciate your kindness and professionalism! (Purchasers of DeForest – Marshall, Va. 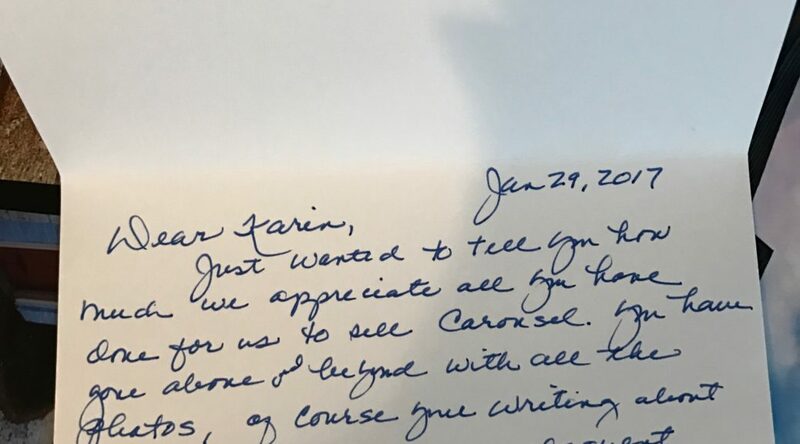 The below note was written by my clients, Norman and Karen Malo just before their leaving Carousel as owners, for the last time. This property closed on January 30, 2017. Sale price was $2,100,000.00. 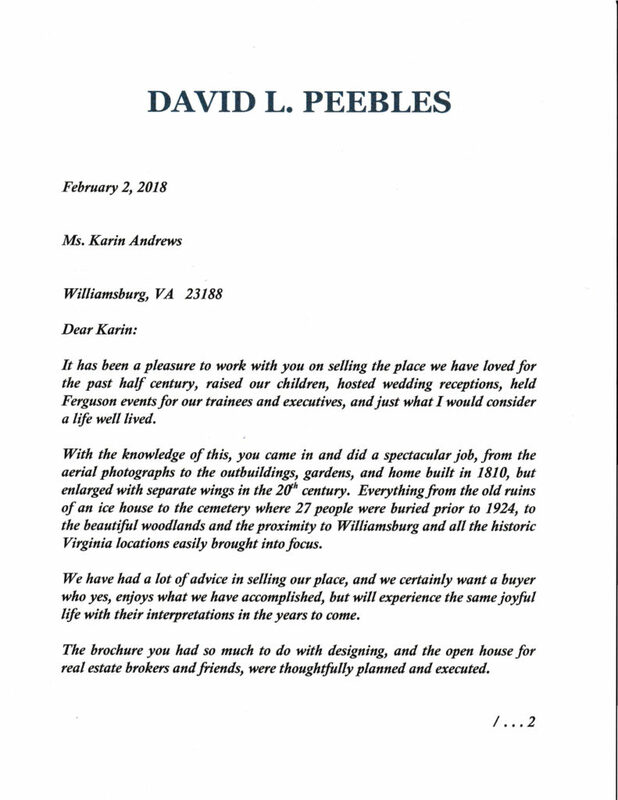 The letter below was sent to me by my seller clients, Mr. and Mrs. David L. Peebles. He is the former Chairman of Ferguson Enterprises. I currently represent them in the offering of Lisburne, Circa 1810 for purchase. Their work in the community facilitated the naming of the Ferguson Center for the Performing Arts.